Cheers John, won't be long before I take her down to the wheel specialist for a fitting. Still cracking on with the car, the crazy weather had delayed getting back to working on the car, so the first job was looking into getting the workshop warm with a higher calibre heating system. I've installed commercial fan heaters these are 3.3kw and required a dedicated electrical circuit, they're awesome! Next to the door skins, these required fibreglassed surrounds for the altered hinges. Nice to see some 360's and 430's in production. It's been a bit quiet recently. 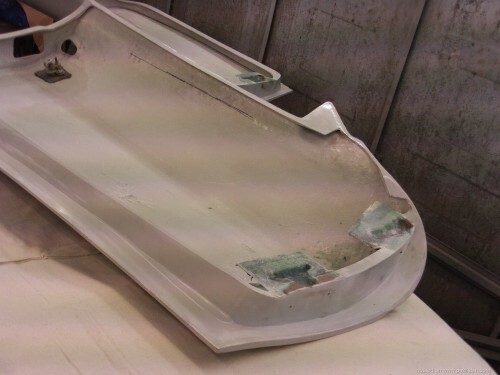 Moving things along, I've completed the scuttle window trim panel, and started to address the gap between the front clip and bumper, it's a bit of a PITA because I have to keep taking the bumper off to work on it section by section, not easy when it's just me. I had purchased the windscreen cheese cutter kit for £10 off ebay, let me say that the wire supplied is pretty much useless. Luckily a windscreen fitter was around the corner fitting a new screen, he gave me a a couple of metres of square stainless wire, I cannot recommend this stuff enough, not one snap and it tore through the poly adhesive. 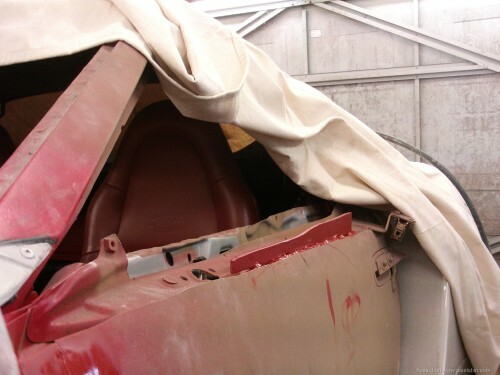 About 6 years ago, I approached Brian and Roland at Stoneleigh, for ideas on how to increase the air flow through the engine bay to take care of the heat produced by the v8, I asked if the 5cudo rear panel would fit, they were unsure, but as ever they were very accommodating, a rear panel was laid up for me and I collected it a month later, the panel has been sat in the corner of a room ever since, until now! I've also finished dressing up the bumper to get the clean look I was after. These are just teaser photos, I've still got to finish the boot lid and light cluster on the rear panel. Prep the rear diffuser for polyester blocking. The bumper and front panel are finished. I've lowered the trim line on the rear quarter by the Pininfarina badge, I referenced some photos in my library which seemed to show the panel join to be about 5mm lower. I would make the rear bumper detachable, and not part of the rear of the car.. If I were to separate the rear bumper from the rear panel I would also have to make up a support frame like the Extreme kit. The work I have carried out is primarily for function, and ascetics second, the rear vent on the scudo panel allows for greater air flow. 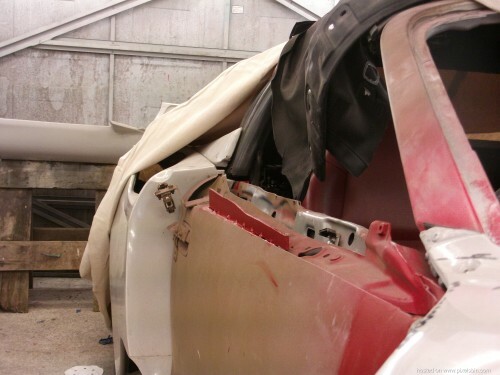 Speaking to Barry at Stoneleigh, I liked where he was coming from, I might carry out some more mods to the front of the car, luckily this will not interfere with my current panel work. Yes I understand what your saying, but one of the things I get told at shows from ‘on lookers’ is that because the rear bumper isn’t a separate piece to the back of the car, it’s an instant recognition for the car being a replica...! Personally? If I was in your shoes and doing doing everything your doing, it would be a small addition to make a large difference..
More updates to the finicky work being carried out. Next the revised light position and sculptured contour around them. To assure correct alignment I squared up the car and used the Formica to act as a refence plain, then with plasticine I stuck the light to the Formica and bonded them in place from the rear using the original fibreglassed cup as a holder, I'll fabricate some top mounts for the other studs off the light.